“A high standard of excellence” and “commitment” are words that describe Kayla Hedlund and her work with Lakes Region EMS. She consistently goes above and beyond, surpassing expectations to advance her knowledge within her role. challenges that help her to progress her clinical knowledge; and if Kayla was not already pushing the envelope, she has recently taken on a new role within Lakes Region EMS. Because of her ability to translate her knowledge into a relatable and easy-to-understand format, she has been chosen to design lesson plans and scenarios for the Critical Care Program that will help teach others and lead them on the road to success. “Success” is also a word that describes Kayla and her endeavors. She is joy to work with, and her optimism brings positive energy to the workplace. Kayla readily volunteers for any project and is up for any task. 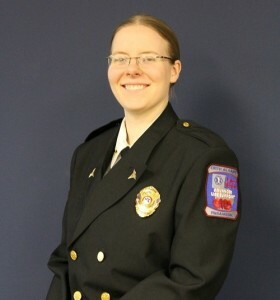 She is kind to all she meets, and has deep loyalty to the patients and staff of Lakes Region EMS. Kayla’s excellence and dedication to all she does has made her more than deserving of this award. We all strive to surpass the expectation, push the envelope, and advance our knowledge, but Kayla has certainly mastered each of these goals. We at Lakes Region EMS are proud to have her as a part of our family.